The first stop took place on 03/24/2012 at Pedlow skatepark (close to Los Angeles) and three more stops are on the works until the rest of the year (The Cove, Etnies, Pedlow). On the Concrete Disciple website, Jeff Greenwood wrote about the first stop that: “To my knowledge this is the first time there has been a contest with an over 50 division. a lifestyle will keep you fit and healthy! Actually, the over 50 division might not be new. A gathering of French OG has organized for the seventh year in a row the FOSSJ (French Old School Skate Jam). The idea of the French Skate Jam is an itinerant contest, once a year over several days. They even have a dedicated website for the contest. The French OG reunite, drink wine with smelly cheese (French Oblige) party and cry over those gone to heaven in between, and that lasts for three days! The next FOSSJ contest will take place in July at Vassiviere, a brand new concept skatepark where the concrete is phosphorescent (which means you can skate at night with the concrete lighted within…) I was told that the FOSSJ was actually duplicated from a US old school contest (though not 50+) that only lasted a couple of years. isTia.Tv: Who got the idea of the contest? Heidi Lemmon: That was my idea. I shoot a lot of the guys in Venice. 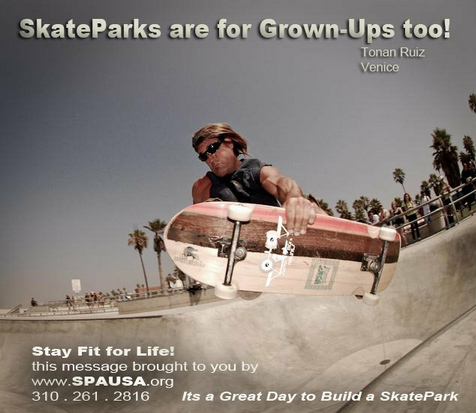 I was shooting TONAN RUIZ, 44, at Venice for fun and I got an idea for our 2012 campaign to promote skateparks. This guy absolutely rips and I thought we need to do something to promote skateboarding under health and fitness instead of injuries and liability. First I talked to Chris at Pedlow Skatepark and he said “We can do a contest here.” Then I called Jeff Greenwood at Concrete Disciples and basically we put this together. We thought it would be fun but didn't really know if anyone would come or if we woukd have any sponsors. Earl from SMA jumped on board and Yoshi from Hill Skateboards and we announced it. We got a great response from everybody, especially the sponsors. The cities have sponsored the series with us and waived all the fees so the contest can be free. 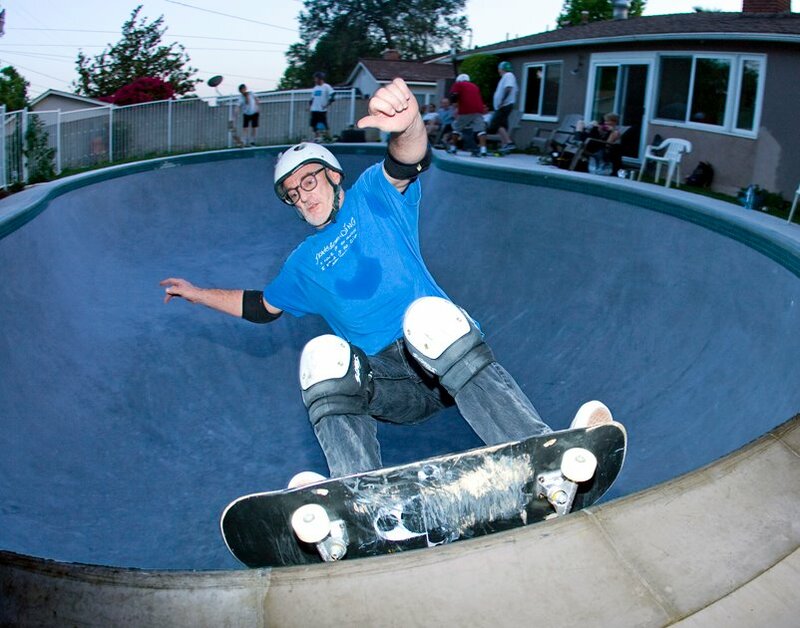 Skatelab is only $10 to enter and Todd has to pay rent and we are happy to support Skatelab and the museum. Sadly we cant have a contest at Venice as they will not waive the fees, almost $2,000, to use the park and we don't want to hold a for profit event. I am getting emails from all over and as far away as South. Africa asking, "How can we bring an OG Jam here?" So that’s pretty cool, we have a lot of Old Guys out there who want to skate and compete for fun. isTia.Tv: The first stop was in March. Since then, have you gathered more sponsors? Heidi Lemmon: Yes, we picked up four more sponsors for the second one. isTia.Tv: How is it going to work? Heidi Lemmon: We are going to do points, so at the end we will have a championship. We are trying to come up with some fun prizes for a grand championship but I don’t know what it could be… someone suggested an old car spray painted and signed by everyone.. no matter what - its all in good spirit and for fun. 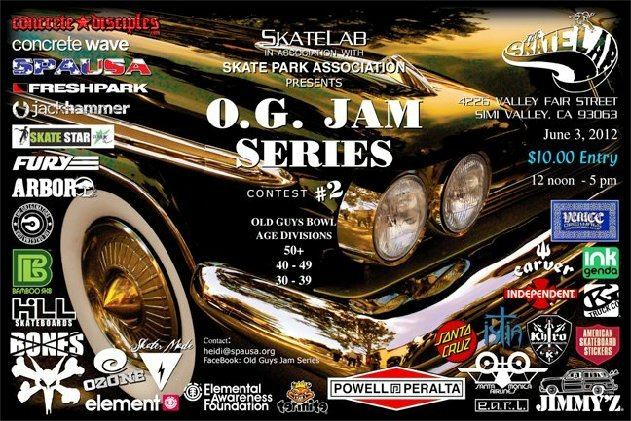 So, if you are over 30 years old and you want to participate, or you just want to support the OG, feel free to come to Skatelab this coming Sunday… Thanks to Heidi, Chris and Jeff. 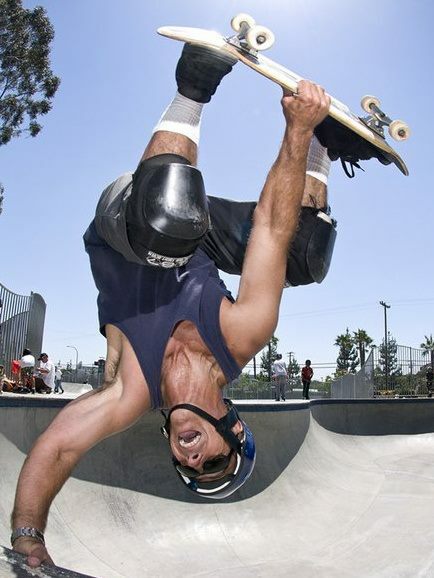 Is Killian Martin Rodney Mullen successor?